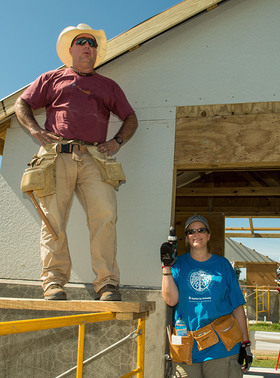 Country music stars Garth Brooks and Trisha Yearwood this week returned to Leogane, Haiti, to participate in Habitat For Humanity's 29th annual Jimmy and Rosalynn Carter Work Project. They were among the nearly 600 volunteers who helped to build 100 homes in the Santo community in partnership with families affected by the 2010 earthquake. Volunteers are helping to construct the homes throughout the course of this week in the Santo community, which is 18 miles from Port-au-Prince and considered to be the epicenter of the 2010 earthquake that devastated the country. This is the second year in a row the Carters and Habitat volunteers have joined together to help build homes in Santo. 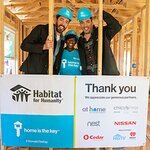 Last year 100 homes were built during the Carter Work Project, and an additional 50 homes were built in the community by volunteers from the Irish nonprofit Haven. The Santo community is part of a larger Habitat shelter program funded by the Multilateral Investment Fund of the Inter-American Development Bank, Habitat for Humanity Netherlands (Samenwerkende Hulporganisaties SHO) and many other donors. Similar to last year, Haven will manage all Carter Work Project logistics, including catering, accommodations and transport throughout the week. In addition, approximately 70 Irish volunteers recruited by Haven will join Habitat volunteers from the United States, Ireland, Northern Ireland, and around the world. Habitat for Humanity has operated in Haiti for more than 28 years. In response to the 7.0-magnitude earthquake that hit Haiti in 2010, Habitat initiated a five-year plan to help 50,000 families. Since that time, more than 40,000 families in Port-au-Prince, Cabaret and Leogane have been served through permanent core houses, transitional and upgradable shelters, repairs and rehabs, damage assessments and emergency shelter kits. Programs focused on land reform advocacy, urban reconstruction and training initiatives have benefitted thousands more. 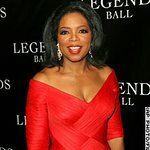 Each year since 1984, President and Mrs. Carter have volunteered with Habitat for Humanity for one week, building homes and hope in 14 countries around the world and providing inspiration to millions of people around the world who share Habitat’s vision of a world where everyone has a decent place to live. This year’s Carter Work Project will be the culmination of a two-month observance of the need for safe, decent and affordable shelter that began with special events on World Habitat Day on Oct. 1, 2012. The purpose is to call attention to the need for adequate housing for everyone by raising awareness and mobilizing people to take action in response to the need of better shelter around the world.